It takes 1,998 litres of water, 142 grams of chemicals plus the cotton, to make one T-shirt. Over 70% of the world's population wear second hand clothes. In 2008 Annual global textile production was estimated at 60 billion kilograms of fabric. 300 million pairs of reusable shoes end up in landfills each year. 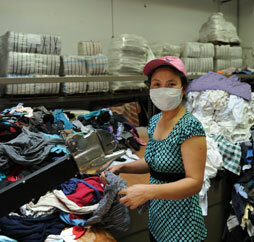 The following will explain how the business of clothing recycling works, why it works and who it benefits. TCTR employs 90 people in our 50,000 square foot sorting facility in Surrey and recycles up to 60,000 lbs of textiles daily, some of this material sourced from the clothing bank program. The collection and processing of used clothing is the primary business of TCTR and we are extremely efficient at our job, from our tamperproof collection bins which only allow drop off items in, to our state of the art equipment and processing facility. Useable clothing is shipped to developing countries, mostly in Africa. Because of the efficient processing system we have at TCTR, we are able to deliver clothing to those who need it, at a price they can afford. We can deliver a T-shirt, for example, to a port in Africa, for as little as 14 cents. Wiping rags. Approximately 8,000 pounds a day of unwearable cotton and cotton blend clothing is sorted and cut in our facility into wiping rags for industry. Textile Recycling. Trans-Continental TCTR initiates the process of recycling various materials of knitted clothing such as wool and acrylics, as well as woven materials, sorting them into many grades: unwearable material of no cotton content, for example, wool knits and wool wovens, acrylics of solids and mixed colours, and others, which through a process of “pulling” are remade into thread and re used to make new clothing and textiles. You may be surprised to know that you can find recycled textiles used as stuffing, insulation and soundproofing in your furniture, car and house and even in the clothing you are wearing. Even our waste cuttings from the wiping rag process are baled as a low quality grade and sent to mills to process into a thread of low grade. The clothing once graded, sorted and packaged is shipped mostly to Africa and sold to distributors who have presold bales of clothing to their customers. As in Canada, the sale of clothing is a large employer, only more so in Africa as there is a total lack of mechanisation. There, the clothing is sold in large markets in every town, and city, village and hamlet; every market stall has an owner/operator and a team they work with. Most of the owner/operators are women. The markets have thousands of stalls and so thousands of families earning an income. There are people who manually unpack the containers, porters, tailors and the sellers all deriving an income from this clothing. Donated clothing is used in emergency relief operations but not in what is an established industry operating on supply and demand principles. The fundamentals work exactly as they would here in Canada. If someone gave away large quantities of new clothing, soon all the retailers and all the companies reliant on those retailers would no longer exist, and ultimately you would create a situation where the populace have become reliant on these hand outs. And that is not what the developing nations need. Developing countries need the opportunity to make their own way. The customers demand a quality product and if the sorting and selecting does not meet their market demands they will buy from someone else. Contrary to popular belief, the second hand clothing trade does not affect the manufacturing of clothing in developing nations. 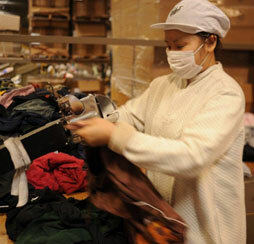 Clothing manufacturing is intended for export, not local consumption. The workers who manufacture the clothing cannot afford to buy it. Much of the world’s population lives on a wage of less than $2 a day, they must prioritise food purchases over clothing to survive. Without the second hand clothing business, many of these people would literally be dressed in rags. The wiping rags provide employment at TCTR, are a better and more environmentally sustainable alternative to paper wipers, and provide local businesses with a local supplier of wiping rags. The complete processing of the textiles, including what would be considered “waste” ensures that no textile article will go to landfill. TCTR ensures that this responsible and ecologically sustainable model is performed here in Canada by Canadian workers in a safe and socially responsible workplace. The benefits are not just financial. The connections created build lasting relationships between business and the community. The relationships involved are not just between the clothing donors, the charities and those who benefit from the charitable programs, employers and employees, customers and suppliers, but they are also importantly, sustainable and necessary relationships between for profit and not- for -profit organizations. The relationship is, in principle, a symbiotic one, for non profits require funding, either from public or private sources and ultimately the money must come from profit generated somewhere. Fundraising through clothing collection banks may involve collection by a non- profit or for-profit organization but ultimately the sale of the collected product involves a relationship with for profit companies, requiring cooperation between the for-profit and not-for-profit sectors. Trans-Continental Textile Recycling supports a program that has a responsible approach to complete recycling and a belief that 21st Century business must develop and build meaningful and sustainable relationships with the community and the environment. 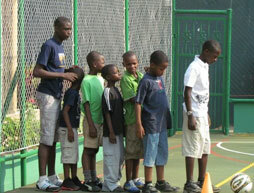 We think locally and act globally. © 2012 Trans Continential Textile Recycling Ltd.